Observed, that the returnto= parameter is ignored. I need the PasswordReset with a working returnto for several bugfixes for E:OpenID. bzimport set Reference to bz57098. I suggest to backport this fix and then to check whether it solves the https://bugzilla.wikimedia.org/show_bug.cgi?id=57289 . Unsure, whether I have to reopen this bug. I reopen it provisionally. Problem is not solved, in my view. 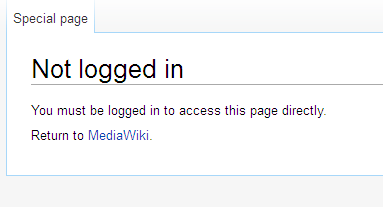 Working correctly on mediawiki.org; closing the bug again. Do you mean it is correct to see http://i.imgur.com/7ADHPHH.png after correctly having changed the temporary to the new password ? It would be better to guide the user and to show then a page saying "You have successfully changed your password. Please log in with the new password." and to present a link to SpecialUserLogin there. having changed the temporary to the new password ? successfully changed your password. Please log in with the new password." This bug is about Special:PasswordReset; not Special:ChangeEmail. > having changed the temporary to the new password ? > successfully changed your password. Please log in with the new password." > and to present a link to SpecialUserLogin there. Yes. It is! This is Special:PasswordReset! This is why I am saying, respectfully stated, you are wrong, that this is solved, in my view, it is not solved. No commits to backport, reopen if there should be any.